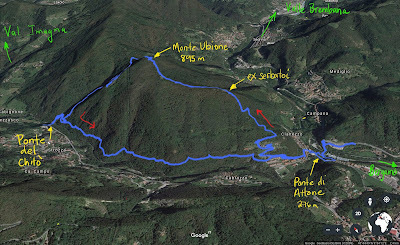 Left: GPS tracks for round-trip hike from Clanezzo to Monte Ubione and back. 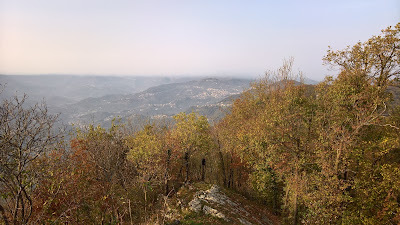 Right: View from Monte Ubione looking northwest into Valle Imagna on a hazy day. 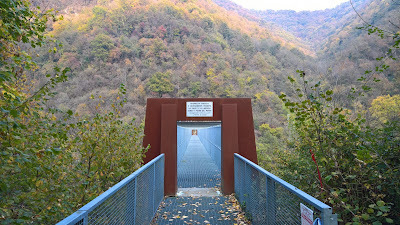 Elevation: 258 m (846 ft) @ suspended bridge over the Brembo River , 895 m (2,936 ft) @ Monte Ubione. Total elevation gain of 772 m (2,533 ft). 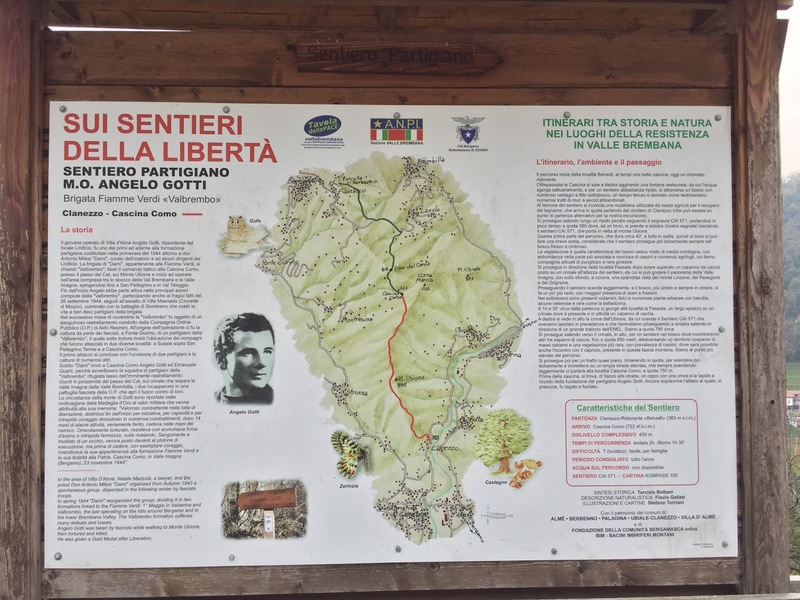 To reach the starting and ending point of this hike, take any bus heading to Valle Brembana (B lines, usually signed as San Pellegrino Terme, Zogno, or Piazza Brembana) and get off at the last stop before the bus enters the valley. The stop is here. Warning: it's a bus stop on a busy, ugly road. Fortunately, you only have to walk about 100 m on said road. Overall, I wouldn't call this the prettiest hike we done or the most serene. First, the woods you pass through are very "disturbed" and not all that pretty. Disturbed here means lots of ivy and weed trees. 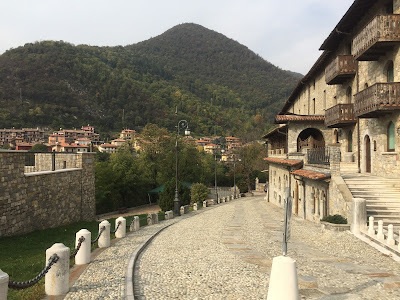 Second, the sound from the traffic in the valleys (both Brembana and Imagna at one point) is always present. These valleys are like that, limited access and busy roads during the day. Negative aspects aside, it's a nice little hike for a number of reasons. 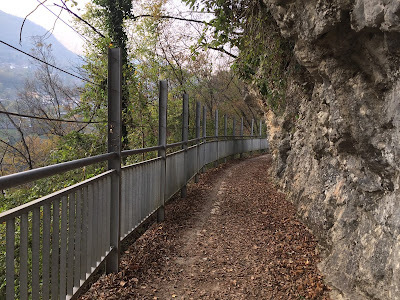 First, you'll work up a sweat getting up to Monte Ubione. A chance for exercise is always welcome, right? As well, once on top of Ubione, it's a pretty view on a clear day. We had lots of haze (foschia) today so it was a little surreal looking. The most interesting aspect of this hike though is that it passes by three different historic bridges. Below Clanezzo you find two of them. 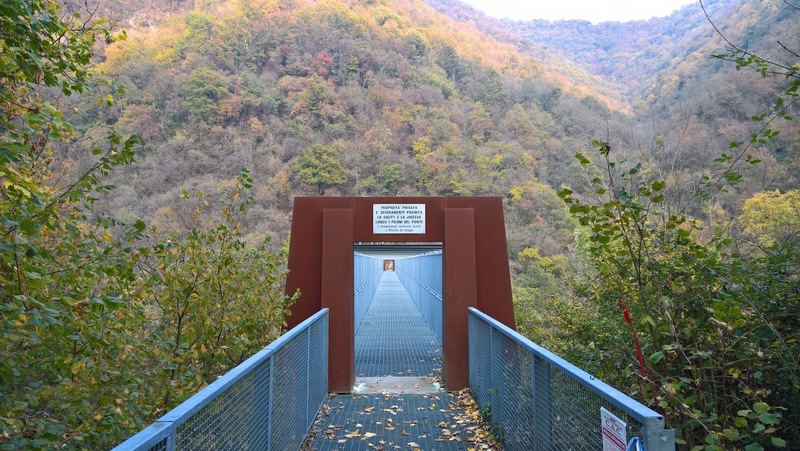 One is a suspended bridge across the Brembo River dating from 1878. 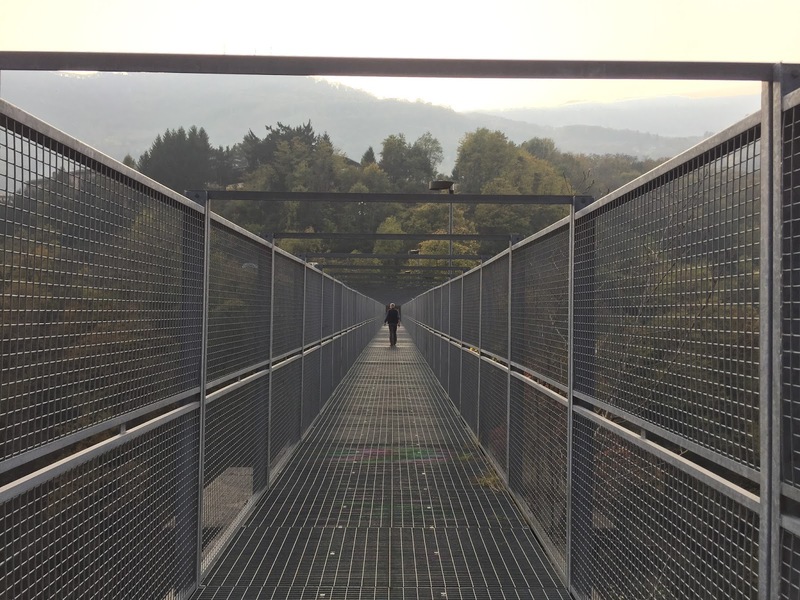 Its called La Passarella or Ponte sospeso, is 74 m long, and dances about as you walk over it. 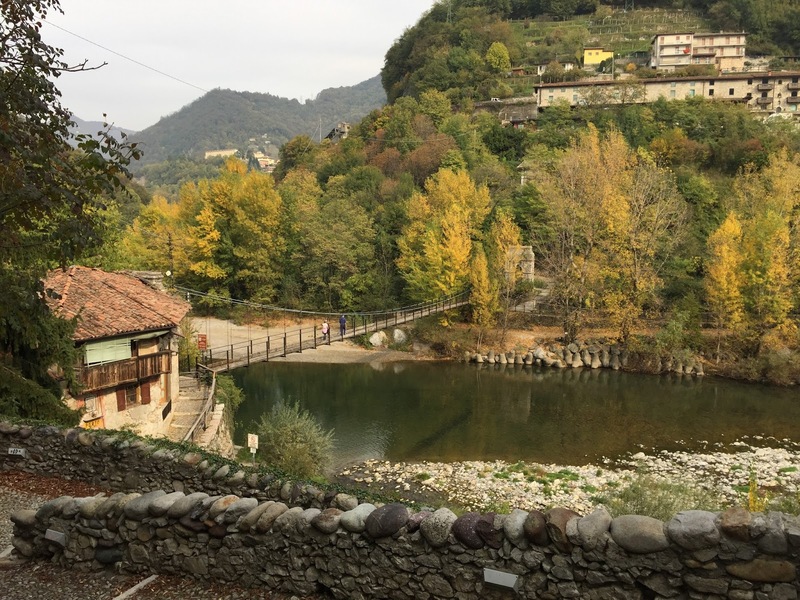 The second bridge, nearby, is an old stone dating from the 10th century that crosses over the Imagna River. This bridge is called the Ponte di Attone and is about 25 meters. 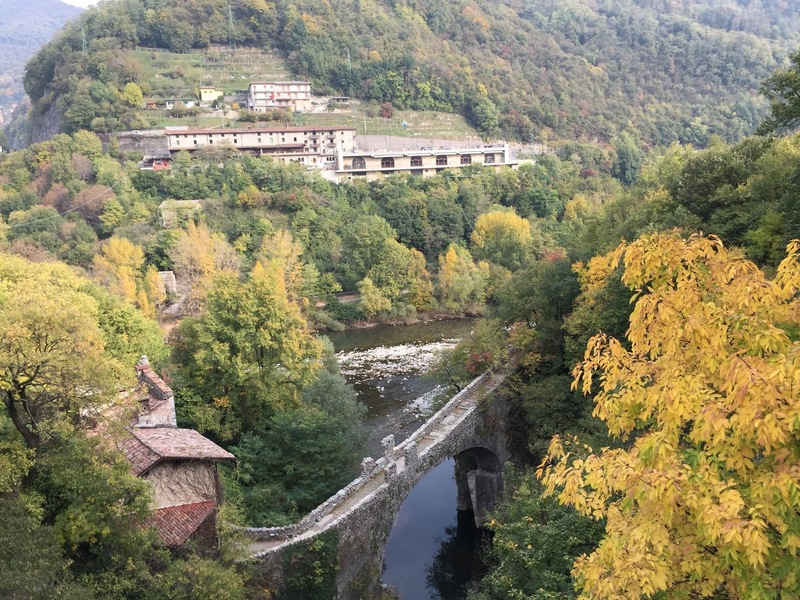 At one time, these two bridges were the only convenient means to get to Bergamo from the Val Brembilla situated north of Clanezzo. Where there is a need, there is someone there to profit from it. At one end of the stone bridge there was a customs point for the Republic of Venice as these bridges were once the border between the Republic of Venice and their rivals the Visconti (Milan). The Imagna River merges with the Brembo River below Clanezzo, both rivers draining their respective valleys. 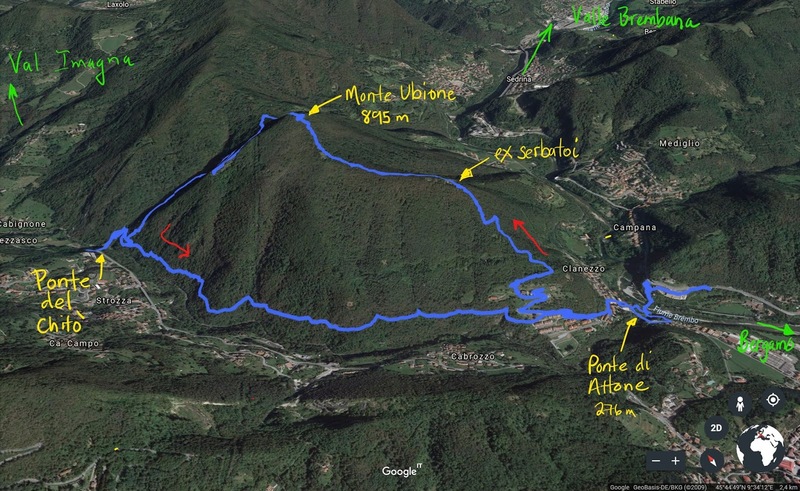 In fact, Monte Ubione and this hike (Sentiero 571) follows the watershed divide (spartiacque) between the two valleys. Before reaching Monte Ubione, you'll wander on a huge empty reservoir (serbatoio) half-carved in the mountain that was at one time used to store water for hydro-electricity. After visiting the two bridges, we start climbing toward Monte Ubione, always following indications for Sentiero 571. At Monte Ubione, we rested for a bit and then continued more or less north until we hit the intersection with Sentiero 584, which took us down toward Strozza. It's at Strozza, that you find the third interesting bridge of this hike, the Ponte del Chitò, built in 1897 and named after the engineer who designed. It's a bridge-canale that at one time brought water from the Imagna River to Clanezzo. 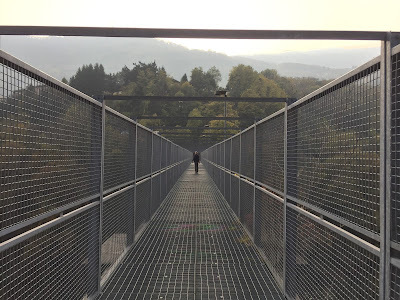 Today, there is a modern steel passageway on top of the aqueduct that allows passage across. From the Ponte del Chitò back to Clanezzo, there is an old canal running more or less level. 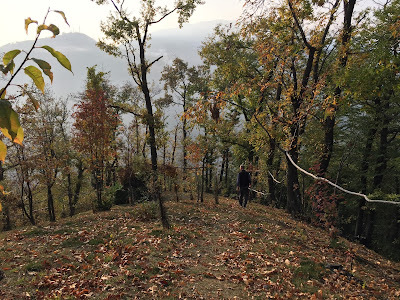 On top of the canale is a walking-cycling path that we took back to the start of this hike. 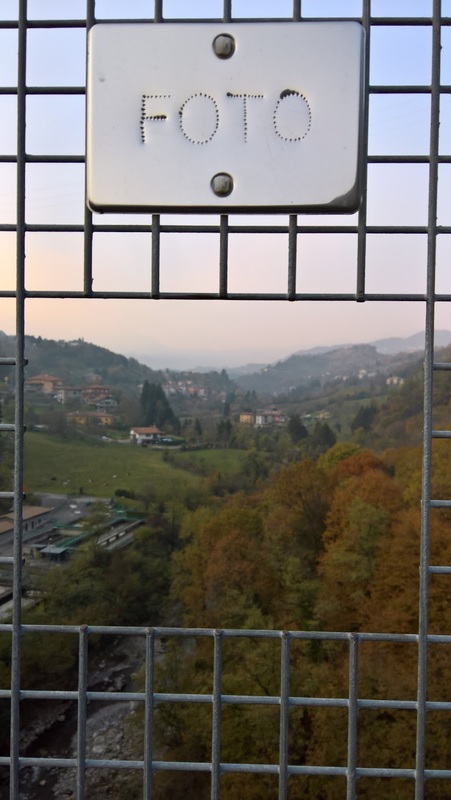 Views of and from Ponte del Chitò, a bridge-canal near Strozza, Italy. 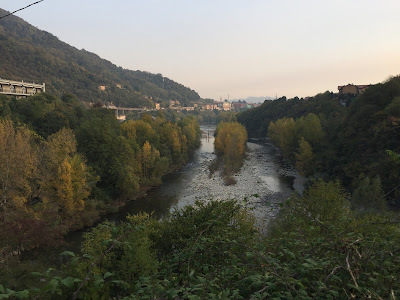 Left: Entrance from Strozza side of Imagna River. Center: Cutout for taking photos from the midpoint of the bridge. Right: Modern walkway atop 1897 stone structure. Left: View of Ponte del Chitò with flanks of Monte Ubione in the background. 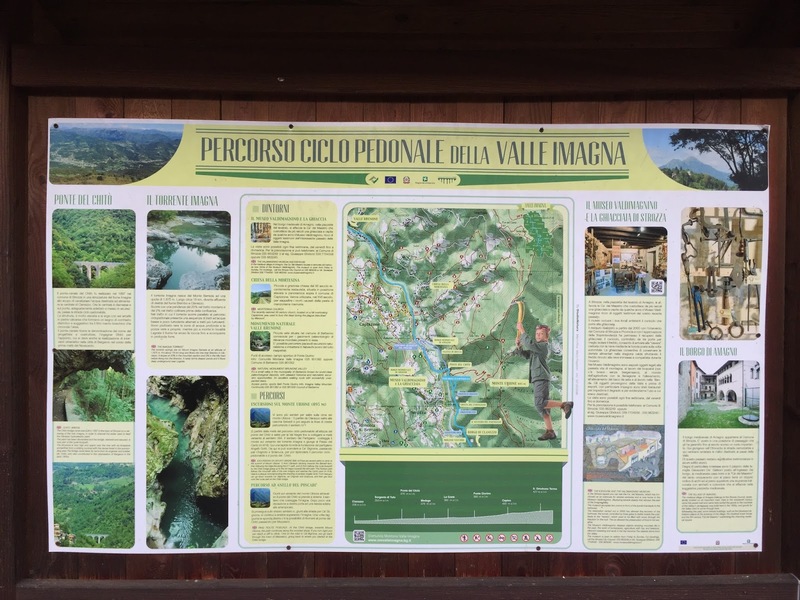 Right: Sign describing walking and biking routes of Valle Imagna. Today's hike is described on the sign. 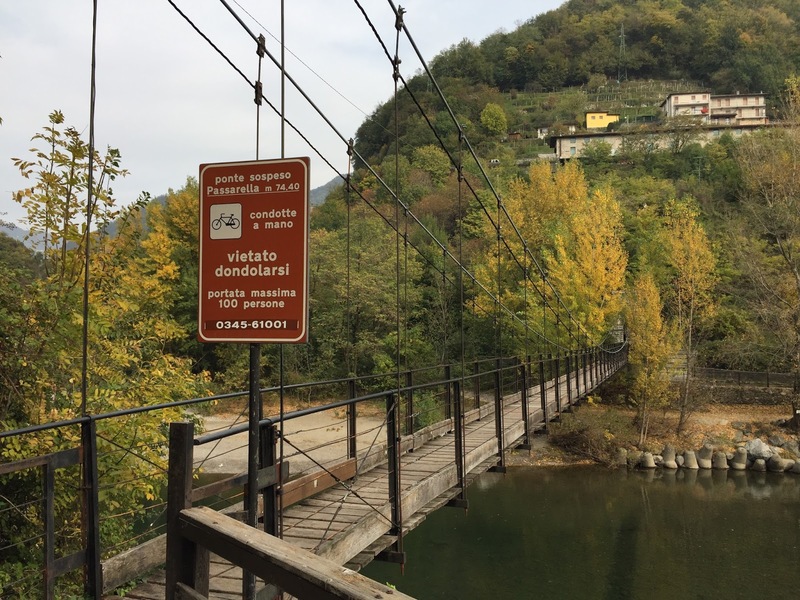 Suspended bridge over the Brembo River, below Clanezzo. The bridge is just over 74 meters long. 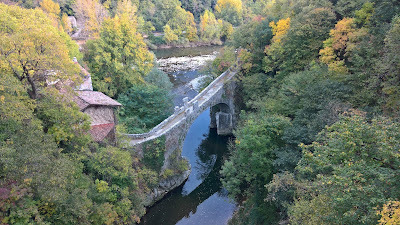 The stone bridge of Clanezzo (Ponte di Attone), at one time a point for collecting customs. 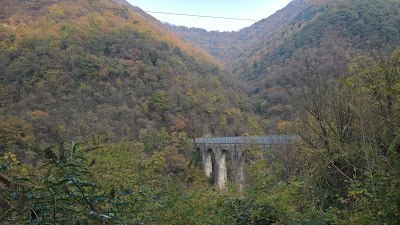 The bridge allows passage over the Imagna River. 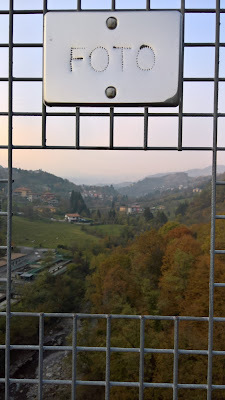 In the background, the Brembo River. Left: The old canal turned walkway near Clanezzo. Right: A roccolo that Sentiero 584 passes through. Left: Start and end of the hike near state route 470. Center: View of the Brembo River looking toward Bergamo. 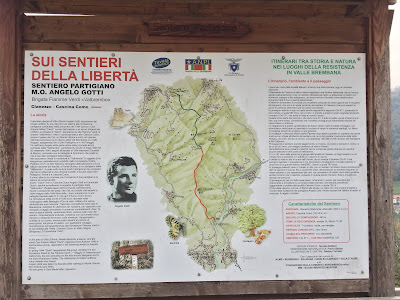 Right: A sign describing another route on Monte Ubione called the Sentiero della Libertà.